Blake Van Egeren during his artist talk. Photo by Laura Murphy. 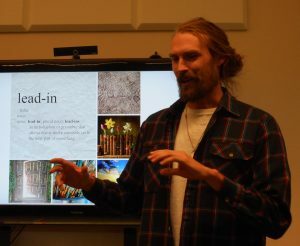 Students new to Southwestern College in the fall 2016 quarter were invited to introduce themselves through their art and other creative processes. On Thursday, October 6th, the Lead-in exhibition gala opened with artist talk presentations by Laura Murphy, Anne Lebednik, Meg Hamilton, Blake Van Egeren, Victoria Begay, Eric Case, and Nicol Blais. 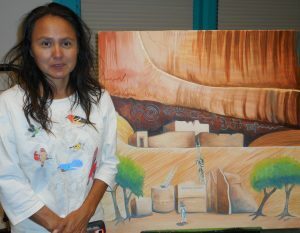 Victoria Begay and her painting. Photo by Laura Murphy. 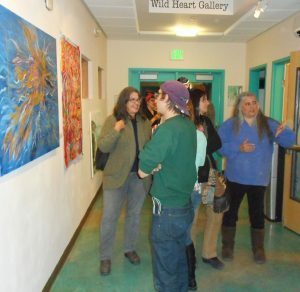 Those in attendance were then able to spend time viewing the works installed in the Wild Heart Gallery exhibit. Anne Lebednik, Laura Murphy, Lauren Roberts, Blake Van Egeren, Cheryl Picolet, Nicol Blais, Heather Kriegshauser, Lili Un, and Michelle LeGrand all had work displayed in the gallery. Lead-in opening night gala. Photo by Laura Murphy. Subsequent blog posts will feature artist statements and images from two of the artists in the exhibit. Lead-in ran through October 22, 2016.